His phone number is unlisted and he always, always uses a pseudonym; when he rhymes those aliases off, one of them is Darren Greer. 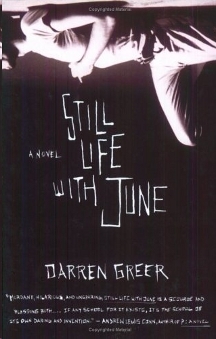 So straight off, reading Darren’s Greer’s novel, Still Life with June, readers know that they will have to be on their collective toes. Actually, this is true of many of the characters in Still Life with June. Except for June. And readers don’t get to know her until nearly a hundred pages into the novel. Someone else that readers get to know in this novel is Darrel Greene. Why do authors choose to use pseudonyms? That’s one of the topics discussed at one of the writer’s groups in the novel and our narrator, too, discusses it outright, sharing some of his pseudonymous works in summary and sharing others by incorporating copies of them directly into Still Life with June. It’s hard to believe that he has anything to hide. Few characters present themselves so boldly on the page. But we haven’t known him for twenty pages before he’s telling us he’s a liar. And a writer. Which is — apparently — the same thing. I know it’s barely February, but I’m fairly sure Still Life with June will be on my list of favourite reads for 2011. Companion Reads: Doug Harris’ You comma Idiot (2010); Shaughnessy Bishop-Stall’s Ghosted (2010). How intriguing. I like the quotes you shared. Sounds pretty good! I think you might like this one, Jenny. It’s got a playful feel to it, even when it’s deadly serious, and, in the end, it works on the very-clever level and on the feels-real-in-the-heart level. This sounds cool! Metafiction is one of my favorite games for authors to play. When it’s done right there’s nothing more fun.